The Racing Steps Foundation-backed driver, who scored a sixth place finish in the weekend’s earlier opening race, lined up third for the reversed grid sprint encounter. 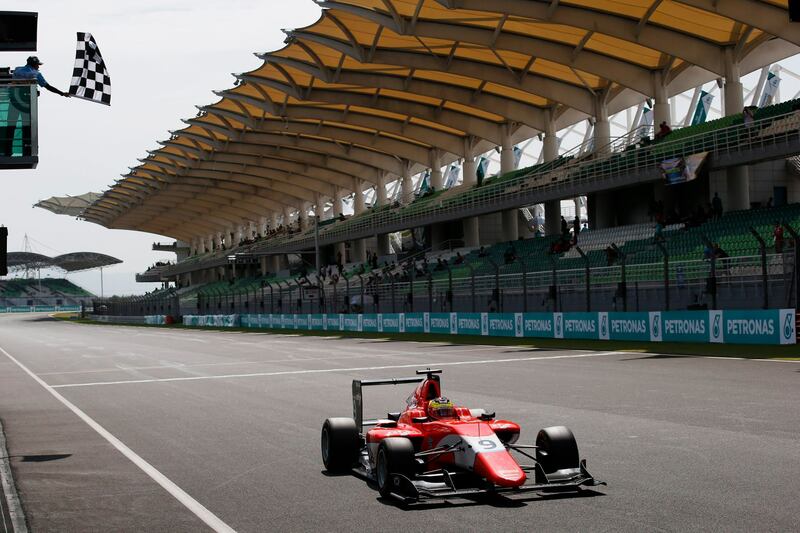 In the stifling hot and humid conditions, Dennis made a good getaway and had a perfect view of an immediate tussle between the front row pair of polesitter Antonio Fuoco (Trident) and ART Grand Prix’s Nirei Fukuzumi. As the field approached the long opening turn one right hander, Fuoco and Fukuzumi both braked too late, forcing the pair wide and off the racing line. That opened the door for Dennis immediately behind, who dived down the inside to take the lead of the race. The Arden International racer then focused on extending his advantage at the front, increasing his margin to over 1.6 seconds after lap two. By the closing laps, Dennis controlled the race, extending his lead to over three seconds before taking the chequered flag comfortably ahead of Fukuzumi with his Arden team-mate Jack Aitken taking the final podium spot. Dennis moves back into fourth places in the drivers' points ahead of the series finale in Abu Dhabi at the end of November. “It was a really good race,” Dennis said. “I had quite a good start and had the run on both [Fuoco and Fukuzumi] and I thought I would go around the outside. “But that soon changed as they braked really late and both locked-up which I was quite thankful for and managed to nip up the inside of them. “That was key because then we could look after our tyres quite well as I know Nirei [Fukuzumi] was struggling a little bit. Dennis explained that the result is a boost to his intra-team battle with team-mate Jack Aitken: “I've never really felt that comfortable here at the track this weekend. I think Jack [Aitken] has generally had the edge over me this weekend. “I made a mistake in qualifying which ruined any chance of a good result. Then I had a big lock-up in race one.